Wake up with a leisurely walk through time and history! Step into the celebrated and storied past with the Telluride Historical Museum at this year’s Telluride Jazz Festival! The Historical Museum will host a Historical Walking Tour on Saturday morning, August 10, allowing attendees to explore the unique history of the charming town. In addition, the Museum offers free admission to their exhibits for festival pass-holders throughout the festival weekend. 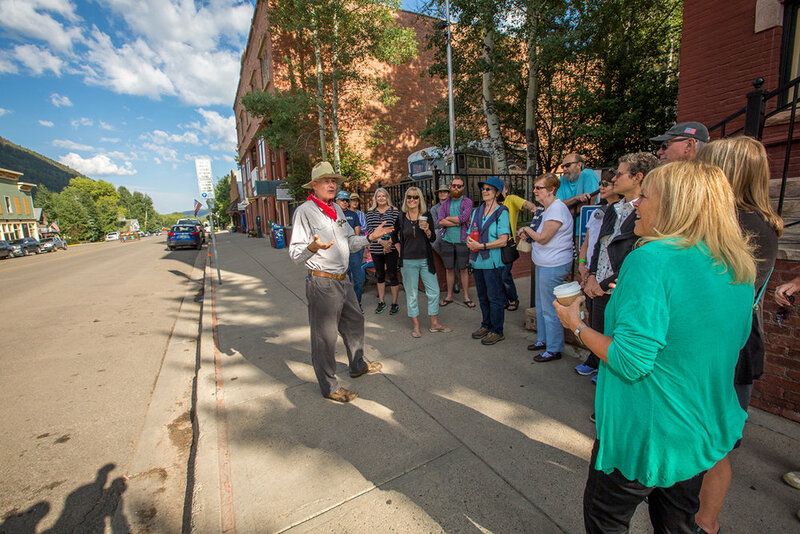 Attending the Historical Walking Tour, along with touring the museum is great way to discover the mining, Ute Native American, ski and festival history that has earned Telluride the designation of a National Historical Landmark. Downtown Telluride is full of Victorian-Era buildings, mining relics and more. Wake up with a leisurely walk through time and history on Saturday morning with tour guide Ashley Boling from the Telluride Historical Museum to discover rich tales from the region’s past. Presenter and long-time local resident Ashley will guide visitors through Telluride’s storied past and celebrated landmarks. The tour is limited to 40 participants, is free of charge and will start at 9 am (MT) in front of the Courthouse, across from Elks Park on Colorado Ave (Telluride’s Main Street). The tour begins with a discussion of the Native american influence in the valley. In addition, topics covered will also include the discovery of silver in 1872, the town's name change from Columbia to Telluride, regional transportation and the legendary Galloping Goose train. The tour then moves into the Sheridan Opera House, covering the 1913 structure and notable artists who have performed there over the years. The tour also showcases the ground level rooms of the New Sheridan Hotel, and points out many original features of the lobby, ladies waiting room, restaurant, and saloon. The tour wraps up at the site of Butch Cassidy's first attempted and successful bank robbery along with a brief overview of the colorful red light district. In 1961, the town of Telluride was designated a National Historic Landmark as one of the most important places associated with mining history in the United States. With just one glance down Colorado Avenue, you’ll see the preserved Victorian Style architecture holding timeless stories of the wild west. Those interested in participating in the walking tour can reserve their spot and get free tickets at the link below! Participants are encouraged to arrive to the Courthouse steps 10-15 minutes early ready to to do a few blocks of walking and about an hour of standing. The tour will conclude back at the courthouse. Show your Telluride Jazz Festival wristband at the Telluride Historical Museum during the festival weekend and receive free admission! Situated in a historic, refurbished 1896 hospital, The Telluride Historical Museum brings Telluride’s past to life through exhibits, tours and events. The exhibits feature artifacts that highlight eras in the region's diverse history. The museum also employs expert historians to offer tours and insight of the museum and the many historic landmarks around town.